What makes Camp Kirkwood especially unique is its location and ability to provide your child with a number of summer camp activities that are usually exclusive to residential camps. Your campers will enjoy activities like zip lines, archery, canoeing, swimming, low and high ropes courses, arts and crafts, hiking, bb guns and more! For more than 50 years, Camp Kirkwood has welcomed campers, giving them a chance to escape the distraction of modern life and experience God’s breath-taking natural world through exploration and adventure. Camp Kirkwood is located just outside of Watha, North Carolina and is managed by the Y. At Camp Kirkwood, the Y is able to create a one-of-a-kind opportunity for kids to build character, develop self-confidence and encourage self expression. Day Camp is full of silliness, fun and creativity! A typical day includes a Wide range of activities from archery and canoeing to A&C and conquering scenic hiking trails. We provide a safe and fun environment for campers to learn new sports and games, camp songs, develop good sportsmanship, build new friendships and learn how to have fun! TEEN DAY CAMP Our camp environment provides a unique opportunity for teens to build leadership skills, particularly in assisting counselors with younger campers. The Y’s Teen Day Camp program operates hand-in-hand with our Youth Day Camps providing young leaders the opportunity to mentor younger kids, participate in daily activities, and help counselors execute programming. Day Campers are provided quick breakfast, hot lunch and snack every day so there’s no need to pack meals throughout the week. BUS STOPS: We provide bus transportation for parents who cannot drive to and from camp every day. Our counselors ensure each child arrives at camp in the morning and gets back to the bus site safely in the afternoon. 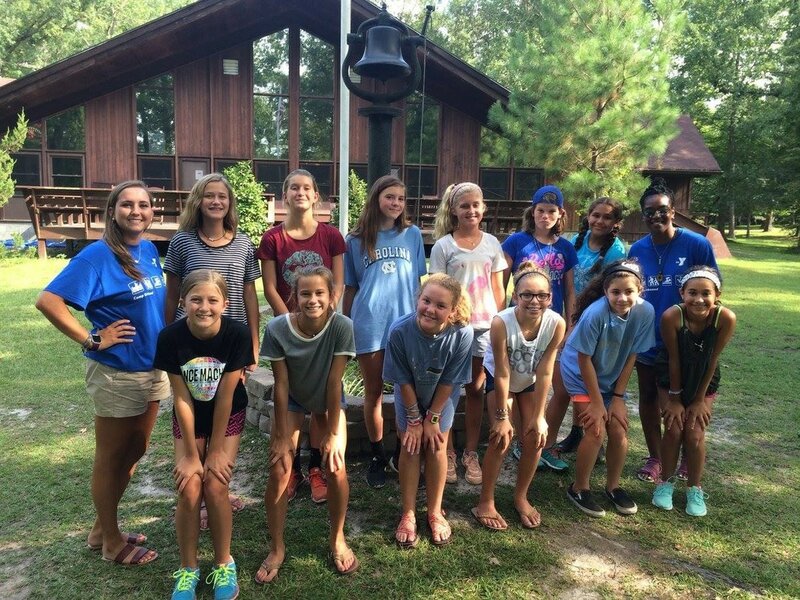 Overnight Camp is the ultimate summer camp experience! Our classic six-day overnight camp, is full of traditions, activities and adventure. From high ropes to swimming in the pool, campers will forge friendships, build confidence, sharpen character and learn critical team skills. Each day is divided into Morning Cabin activities and Afternoon Choice activities. Each cabin chooses their morning activities to do together. These activities are intended to build team skills and develop relationships within the cabin. Afternoon Choice activities are selected by each individual camper. Campers will create their own afternoon activity schedule and focus on skill development. Campers will also swim in our outdoor pool everyday. Evening activities are all camp games intended to develop a strong sense of belonging here at camp. HOLDOVER WEEKENDS: Campers who are signed up for consecutive weeks of camp may pay $80 to stay at camp during the weekend. All camp programs begin on Sunday. Arrive for check-in between 3:00-4:00pm to move your camper into their cabin, meet the staff, and turn in any medications. Parents and guests are also welcome to tour camp and stay for our Opening Ceremony at 4:00pm. The camp program ends on Friday and campers should be picked up between 4:00-6:00pm. In regards to contact throughout the week, studies by the American Camp Association have shown that calling home is detrimental to the development of your child's independence, and can create or aggravate seious homesickness. Since camp is only a week long event, we like to encourage complete immersion in the experience from the moment of arrival to the moment of departure. Parents can call the director and get a report on their camper(s) at any time. The camp environment provides a unique opportunity for teens to build leadership skills, particularly in assisting counselors with younger campers. Camp Kirkwood’s leadership camps give teens the opportunity to build their skills, confidence and capacity for working with people of all ages. The Y’s Leaders In Training program is a two week, overnight camp designed to help teens develop their leadership skills. This camp operates hand-in-hand with our Traditional Overnight Camps, providing young leaders the opportunity to mentor younger kids, participate in daily activities, and help counselors execute programming. The Junior Counselor program allows any 16 year old teen an opportunity to volunteer their time this summer to serve as a Junior Counselor. JCs will assist counselors with all aspects of their job. They will help counselors clean cabins, facilitate activities and have fun with the campers. JCs will never be alone with campers and will have a counselor with them at all times. This is a volunteer program. JCs may volunteer for either Resident or Day Camp programs. When working with the Residential Camp, JCs are required to live on site during the week. This is an excellent way for your teen to gain volunteer hours and also to get a glimpse of what working at Camp Kirkwood is really like. ​Contact Luke Dooley directly to schedule a home show at your house. Just pick a date and time and invite three or more families who may be interested in attending Overnight Camp. Our staff will attend your home show, talk about camp and answer questions. Just for hosting, your camper will receive $25 off the cost of Overnight Camp. You will also receive an additional $15 for each camper who signs up for camp at Kirkwood. Nurses - FREE Week of Camp!!! ​Camp Kirkwood is always looking for nurses to help us during the week. Nurses can volunteer to be the camp nurse for any week during the summer. Nurses will be provided on site living accommodations separate from campers during their week. Nurses who volunteer will also receive a free week of Overnight Camp to gift to any camper for every week they work. Contact Luke Dooley directly for more information. Upon arrival, campers are given a Camp Kirkwood T-shirt and a nametag. If you would like to purchase other Kirkwood items for your camper, contact the camp director before your week of camp. All items will be waiting for your camper in their cabin when they arrive. We carry sunglasses, back packs, and a wide variety of stuffed animals. We also carry car magnets so you can show off your Camp Kirkwood pride throughout the year. The goal of the YMCA is to ensure every child has an opportunity to enjoy the magic of camp. If you require financial assistance, please do not hesitate to apply for a camp scholarship. Just go to www.ymcasenc.org to print the financial applications for your camper. If you have any questions regarding financial assistance, please feel free to contact Luke Dooley at camp or email luke.dooley@ymcasenc.org for more information.